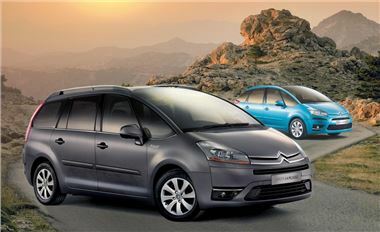 Citroën's C4 Picasso and Grand C4 Picasso are now even more fuel and CO2 efficient, thanks to the re-homologation of the 1.6 and 2.0HDi diesel engines in both models. For versions equipped with the 1.6HDi 110hp DPFS* power-plant, with manual and Auto EGS** transmission, combined cycle fuel economy is improved by almost 4%, whilst CO2 emissions are reduced by 5g/km. Cars fitted with the more powerful 2.0HDi 138hp DPFS* unit, with the Auto EGS transmission, benefit from a 1.7% improvement in fuel economy and a 2g/km reduction in emissions. The improved CO2 emissions result in a 1-point reduction in BIK tax rates for all versions and lower 1st year VED for the 1.6HDi 110hp manual models - from £125 to just £110.